In this historical gem originally published in 1932, Charles Hardy examines the history of the Federal Reserve's policies and their impact on the organization of the banking system in the post-World War I period. 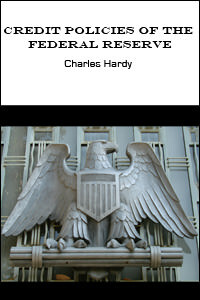 Mr. Hardy deals with the fundamental problems of central banking policy, namely, the purposes which an organized banking system should seek to accomplish, the efficiency of the means which such a system has at its command, and the tests by which it can gauge the success of its efforts. The author provides a detailed background of central banking activities and credit control decisions for the 1920's and early 30's. Especially noted and examined is the importation and management of gold and gold certificates during this period as well as international coordination between central banks. Hardy's work is an essential review and critique of Federal Reserve policy implementation during a period which was highly influential to the Great Depression. 616 pages, originally published 1932.